Thai food is one of my favorite types of cuisine and I’m always on the lookout for a good place to find some great Thai dishes. This 2019, there’s a new “hub” in Torrance just for that! Thai Hub Torrance Street Food and Dessert Cafe just opened up this new year and is quickly becoming a go-to Thai place for those in the South Bay (and beyond). Thai Hub Torrance says that their love for Thai food is “infinite” and this is evident in the menu consisting of a large variety of Thai dishes. One can find authentic dishes such as E-Sarn Rice Sausage, Tom Zap Baby Pork Rib soup, Thai Papaya Salad and Ka prow Grounded beef. A good way to try out their different offerings is through their lunch set. The lunch set is offered daily from 11am through 3:30pm. I’ve found that these are great deal to get a glimpse of their variety. Their Pad See Ew lunch set is one of my favorites. The Pad See Ew comes with egg, wonton soup and two chicken wings. The chicken wings happen to be one of their appetizer offerings too! The Thai style breaded chicken wings are scrumptious! Served piping hot, each bite gives a delightful crunch. Not to be outdone is the wonton soup that consists of fully stuffed chicken and shrimp wontons, tender BBQ pork and bok choy. The star of this lunch set of course however is their Pad See Ew. The fact rice noodles have a good mix of eggs, Chinese broccoli and chicken. Another popular lunch set and one that I also really like is their Yellow Curry Chicken. Yellow Curry Chicken is a staple in Thai cuisine and here at Thai Hub they really know their curry! The Yellow Curry is full of flavor! There is tender chicken breast, potatoes, onions and carrot. It’s great over the white rice and mixed with hard-boiled eggs that comes with the set. On the side is their Spicy beef Salad. This salad has a bit of kick to it because of the spicy lime dressing. There is grilled beef, cucumber, lemongrass, tomatoes and mint. I am happy to see this new “hub” for Thai food in Torrance! It’s one amazing new addition to the South Bay this 2019! 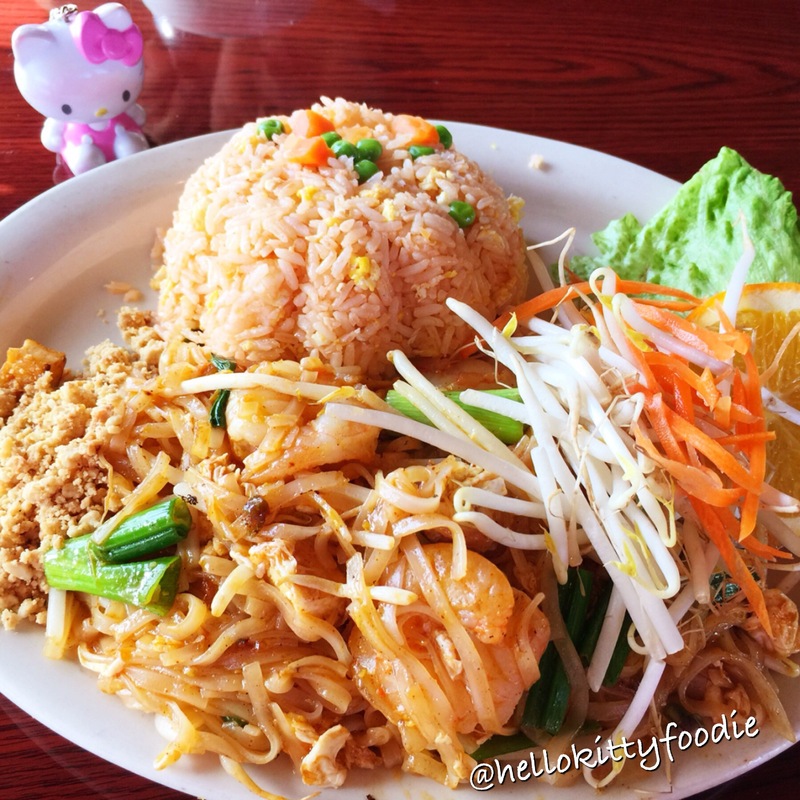 For more smiles, please see my Yelp review on Thai Hub Torrance. Hello Sisters Thai, The Ordinary Cafe! 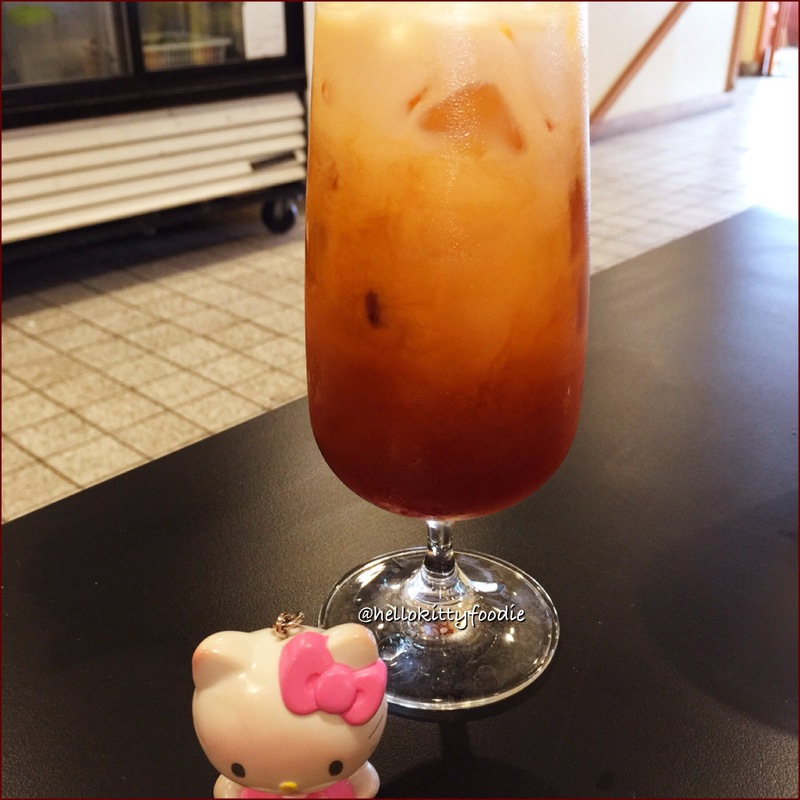 Sisters Thai, The Ordinary Cafe in Fairfax, Virginia is far from being ordinary. Walking in, I could not help but be intrigued. There is a giant movie marquee with the restaurants name. 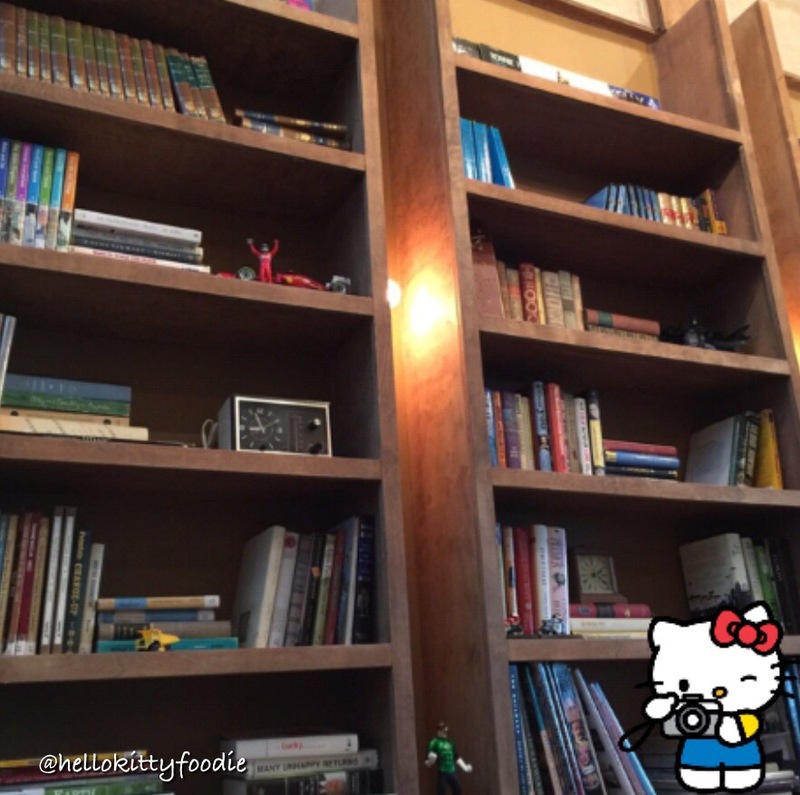 One wall is filled with books, making the cafe look like a little bookstore. The place just has an overall cute, unique and homey vibe. This theme somewhat even overflows to the menu as the menu consists of a variety of traditional homestyle Thai cuisine as well as interesting Thai street foods. To start off my meal, I chose to get the Angel wings. I have always been a fan of angel wings. Here at Sisters Thai they had three chicken wings stuffed with ground chicken, glass noodles and veggies. There was sweet chili dipping sauce on the side. Golden deep fried and perfectly crisp on the outside, this appetizer was delightful! The chicken itself simply came off the bone. The filling was well seasoned and every bite was just heavenly. This appetizer truly was an angel. After the Angel wings, I tried the Drunken Noodles with beef. This was one spicy dish. The flat noodles were topped with plenty of beef mixed in with some spicy chili peppers, basils and jalapeños.It’s one very flavorful dish sure to bring a bit of fire to your mouth. To offset, the heat of this dish, I had an order of Yellow Curry with chicken. I am a big fan of curry. I find the complex combinations of spices and herbs to make this creamy creation so delightful. Sisters Thai does a good job with their curry. There was plenty of thick, curry sauce with tender pieces of chicken, sliced carrots and potatoes. I was quite pleased with putting all this curry over the white rice. It was very fulfilling. I really enjoyed dining at Sisters Thai, The Ordinary Cafe. 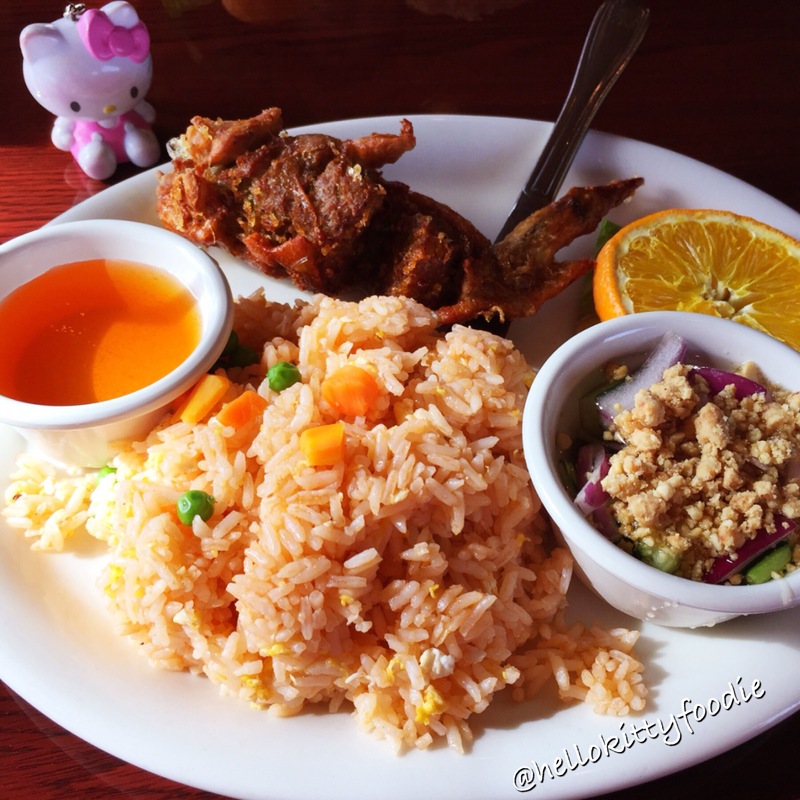 As I mentioned in the beginning of this blog post, Sisters Thai is far from ordinary. The overall atmosphere is intriguing yet comforting. Their food is traditional yet distinct in taste. It was no ordinary day for me when I dined here. 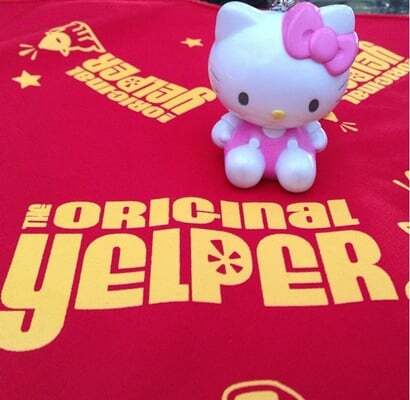 For more smiles, please see my recent Yelp review on Sisters Thai. I’ve always been a fan of Thai food and Japanese food. A lot of blog entrees have been dedicated to visiting Japanese and Thai restaurants so just imagine this blogger’s delight when I discovered a restaurant offering both types of cuisine! 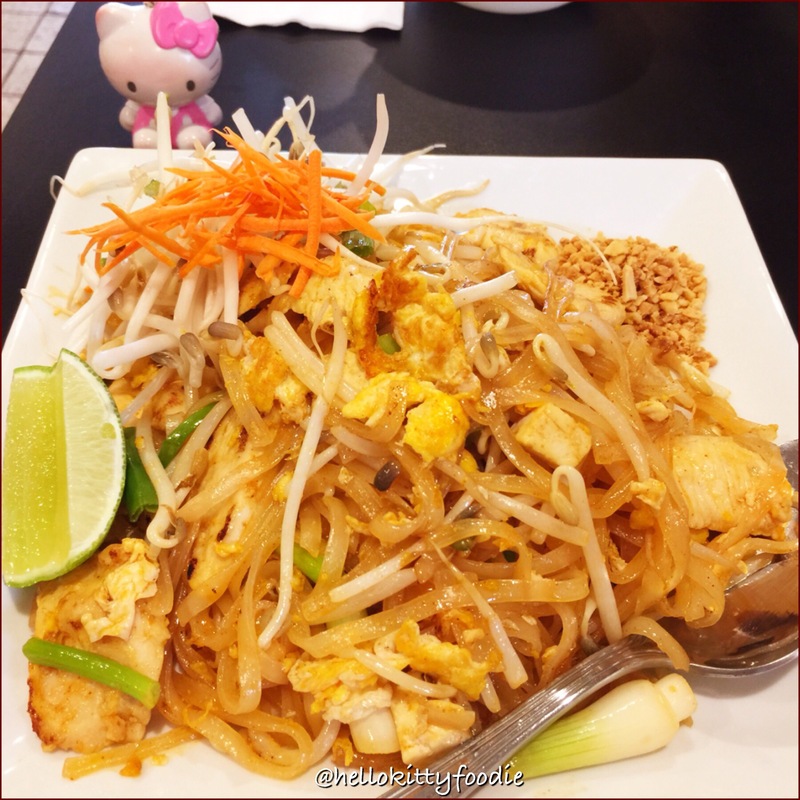 The newly opened Thaipanese restaurant in Lomita, California specializes in both Japanese and Thai food. The menu of this place is amazing. They’ve got Japanese specialities such as sushi, teriyaki and ramen and they have Thai dishes such as pad thai and curry. I found their lunch special to be really great because you can get a good mix of Japanese and Thai food. Their lunch specials come with rice, miso soup, house salad and your choice of sushi roll. Whenever I go to a Thai restaurant, pad thai is a staple dish I must try. For Japanese restaurants, my favorite sushi is the California roll. It was a given that one of the first lunch special combos I would try here at Thaipanese would have both . I liked the pad thai with the slight sweet peanut sauce here. The California rolls were fresh and tasty with a creamy filling of imitation crab. My other favorite Thai dish is curry! I’m also a big fan of veggie rolls. Here at Thaipanese, they have both. The yellow curry with chicken is spicy and had lots of sauce that was perfect over the white rice. The spicy curry was a good match for the veggie rolls. I liked the crispy veggies and avocado inside the veggie rolls. I love that Thaipanese offers the best of both the worlds in terms of Thai food and Japanese food. It makes me smile that I can get dishes with both types. If you’re a fan of either Thai food or Japanese food, this is a place that will surely make you smile as well. Hello Blue Basil Asian Cuisine! It’s a new year and time for new discoveries and new eats! 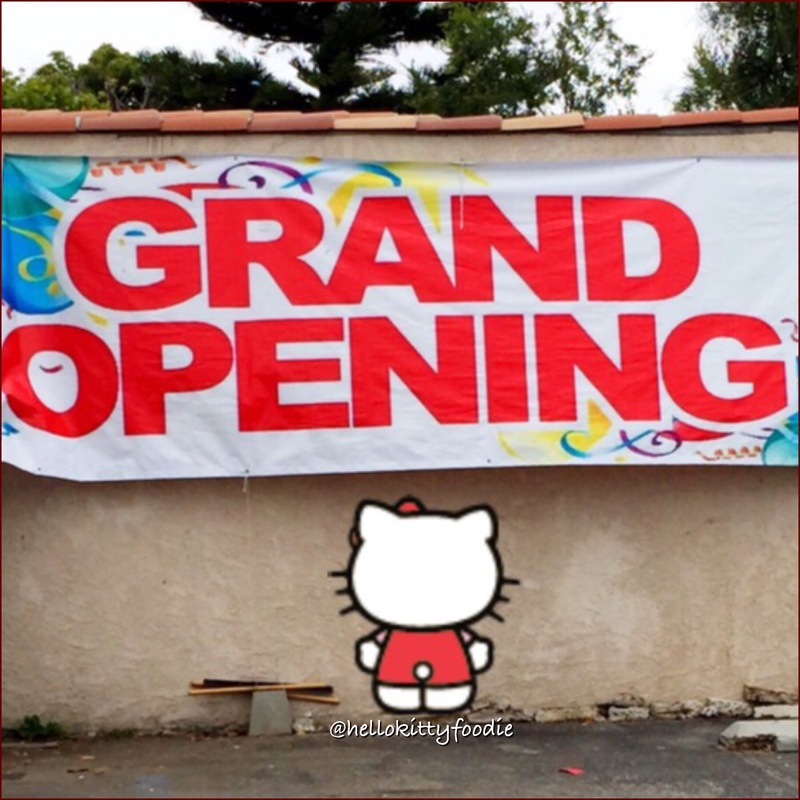 Just right after the holidays, was the grand opening of a new Asian eatery in the South Bay! Located in Torrance, California is the brand new Blue Basil Asian Cuisine! I am a big fan of Asian eats and was intrigued to find this place offers a gigantic smorgasbord of Chinese, Vietnamese, Japanese and Thai dishes. They also have American and Italian food! Looking at the menu there just seemed to be something for everyone! I came during lunch time with my mom and we started off our meal with an appetizer via their Vietnamese egg roll. Six crunchy pieces of Vietnamese egg rolls packed with meat and veggies was presented to us! I loved the wrapping that they used for the crispiness did not go away during the whole meal. It was fresh tasting all throughout. They were also very generous with the filling. For our main courses, we chose to do their lunch special which is served with seamed rice and a daily soup. The soup of the day was a nice egg flower soup. It was good for a chilly day like today. The first of our lunch entrees was the Fried Chicken with Basil. An abundance of flavorful basil leaves was mixed in with tender pieces of chicken and red chiles for a delicious and slightly spicy stir-fry that was perfect on top of white rice. Our other entree was the Beef with Vermicelli in Satay Sauce. Tender pieces of beef along with crunchy bell peppers and sweet pineapples were tossed on top of long, soft, silky vermicelli noodles. This noodle dish made for a light and tasty entree. The deliciousness of this place does not end with their appetizers and entrees because equally impressive is their drink menu that consists of various milk teas, fresh fruit drinks and ice milk drinks. I chose to get a strawberry, pudding and boba ice milk drink. When my drink came out, I was happily surprised with the large concoction in front of me. The large drink consisted of sweet milk and lots of strawberry, pudding and boba inside. It was a perfect pairing to all the savory dishes we had above. Blue Basil Asian Cuisine is one nice addition to the South Bay! Offering a variety of Asian dishes, it is one place that every one can enjoy. I know that I will be back here for sure this year. For more smiles, please see my recent Yelp review on Blue Basil Asian Cuisine. Hello Suki Time Thai Kitchen! 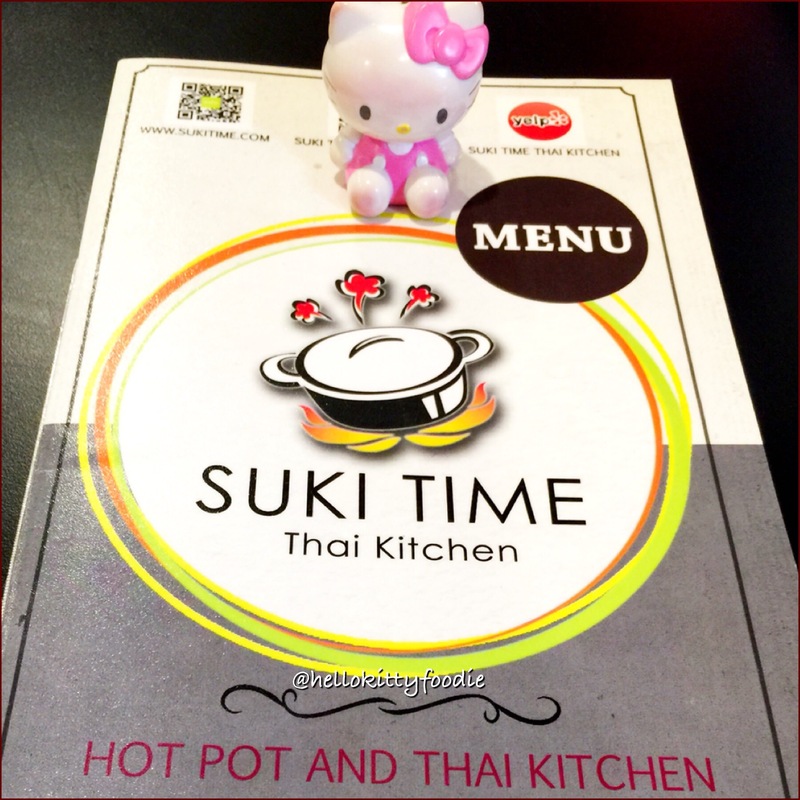 When I first spotted the newly opened Suki Time Thai Kitchen, my curiosity was quite peeked. I am a big fan of Thai food and am always on the look out for good Thai places. I was further intrigued upon hearing that not only did their menu have traditional Thai dishes like Satay and Panang but it also had Thai hot pots! 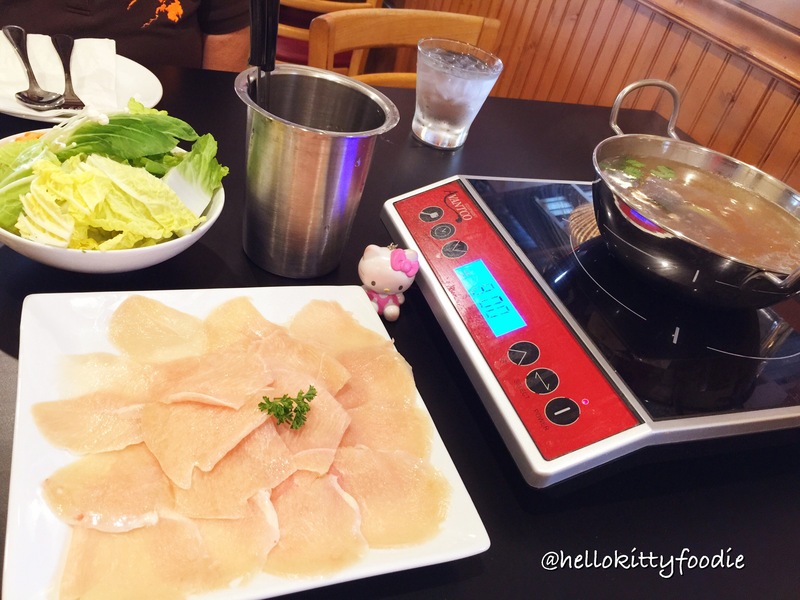 With Thai food and hot pot offerings, it did not take long for me to check this place out! It was a cloudy day the day I went so hot pot seemed perfect. 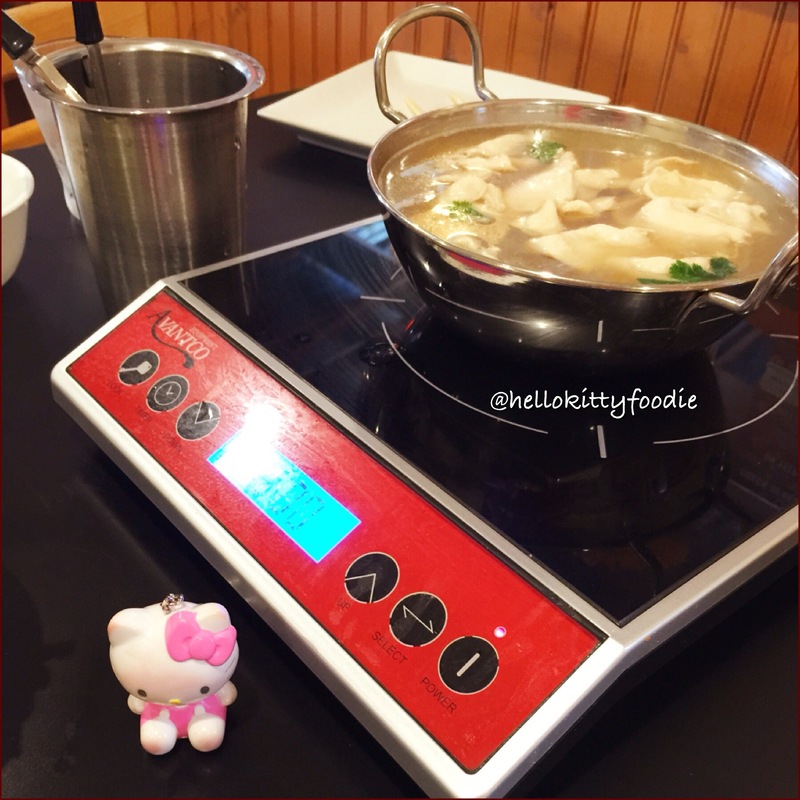 The hot pot here comes in two ways. The first was is as a food set for solo eaters. The second way is family style for groups. Although I came with a friend, we chose to get a food set so that we could try another Thai dish with our meal. The food set comes with a bowl of vegetable, choice of rice (white or brown), regular soup and choice of meat platter (USDA Prime beef, USDA choice beef, pork, white chicken breast and vegetable). For the food set, I chose to get the regular soup which is a mixed vegetable soup and white chicken breast. The waiters brought out the broth and meat along with a bowl filled with mixed seasonal vegetables for us to cook at our table. This is one of my favorite things about hot pot! I love being able to see the cooking of the pot right in front of me. 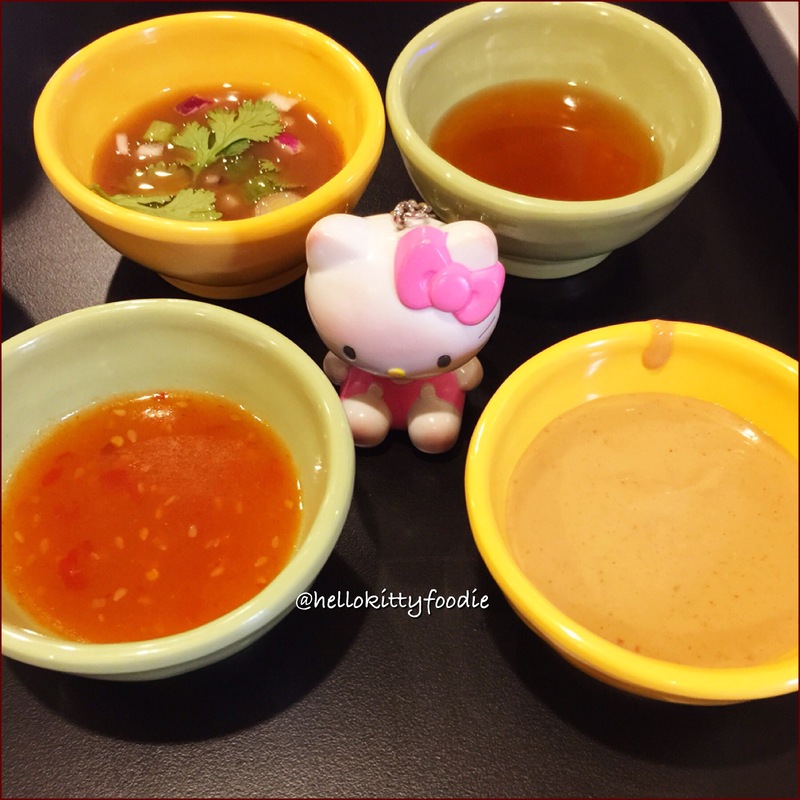 To accompany the hot pot, Suki Time Thai Kitchen has different sauces for the dipping of the meat. 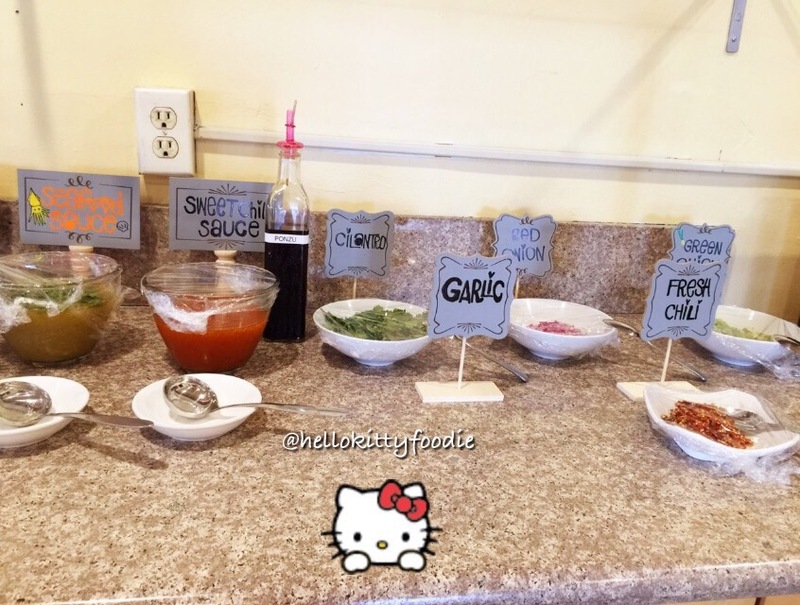 The sauces were all at the Sauce bar. 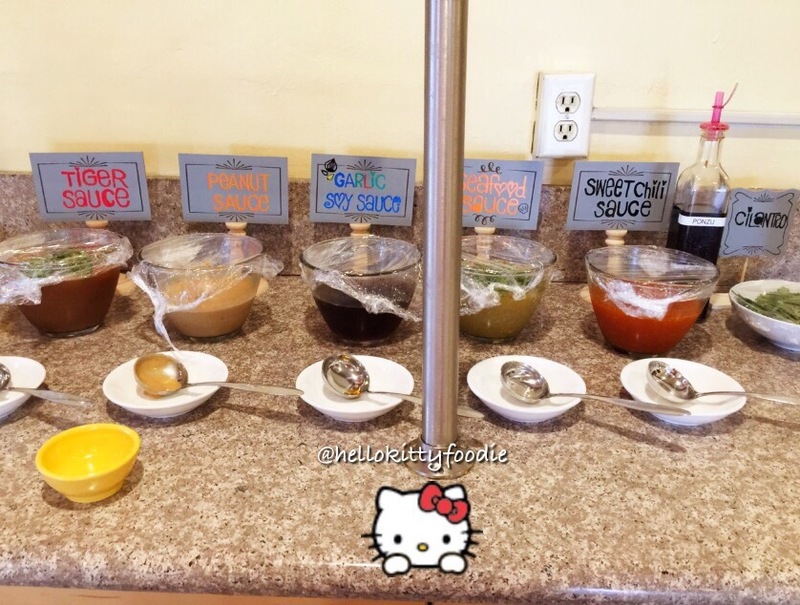 They had different sauces like Thai peanut sauce, chili sauce and even a crying tiger sauce. They also had offerings of cilantro, red onion, green onion and garlic to add to the soup and to enhance the flavor even more. My favorite of all the sauces and garnishes was the peanut sauce. It’s a little sweet and adds a different kind of flavor to the soup. The mixed vegetable soup, white chicken breast, various veggies, garnishes and sauces all came together to make a hearty hot pot. Alongside with the hot pot, I got to try their Pad Thai. It’s stir fried noodles with chicken, their special Suki Time sauce, peanuts and sprouts. The noodles were very long and soft and the chicken very lean. Last but not least I got a complimentary Thai Milk Tea. It was refreshingly sweet drink and perfect accompanying drink for the meal. I loved how this place gives a taste of Thailand through both traditional dishes like Pad Thai and drinks like Thai Milk tea and through not so traditional dishes like Thai Hot Pot. The hot pot is something different. 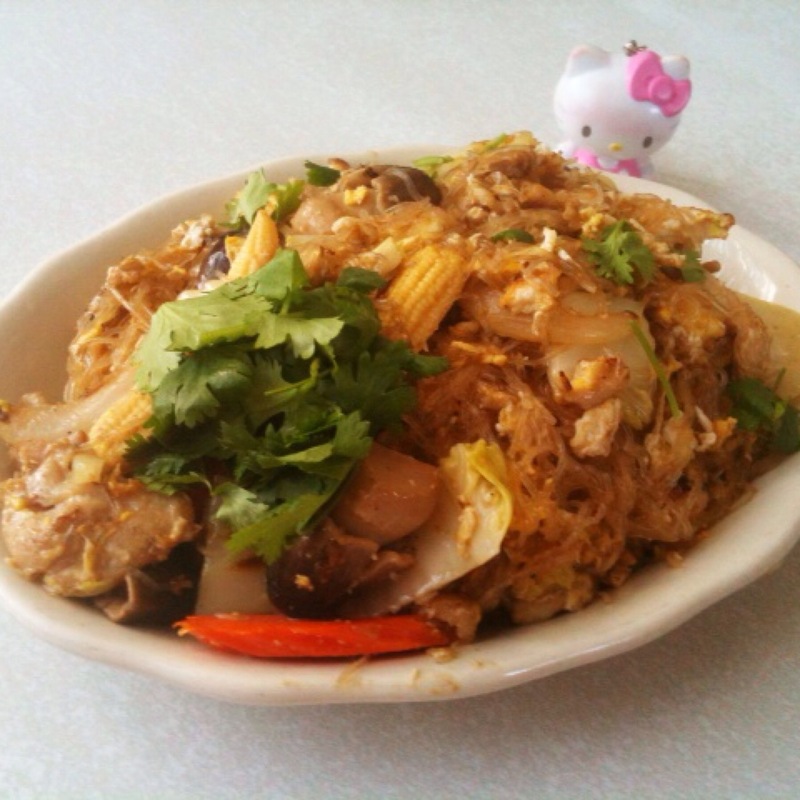 It has the same good Thai flavor but not through a dish that is typically seen at Thai restaurants. I like how you even have the choice of making the hot pot with Thai broths of Tom Yum and Pok Tok too. Suki Time Thai Kitchen’s offerings of Thai Hot Pot and traditional Thai dishes made me smile. Here it goes…I’m about to reveal one of my favorite restaurants ever. Drum roll please…Thai Thani in Redondo Beach. I have loved this restaurant ever since I was a little girl. From lunches with my parents to dinner celebrations, this Thai restaurant has always had a special place in my heart and remains to be my favorite place for Thai food. Lunch is my favorite time to go here because their lunch specials come with either salad or soup. I love their salad because it comes with their own housemade dressing. The salad dressing is oh so creamy. I often have a hard time choosing between salad or soup because their soup is delightful is so well. 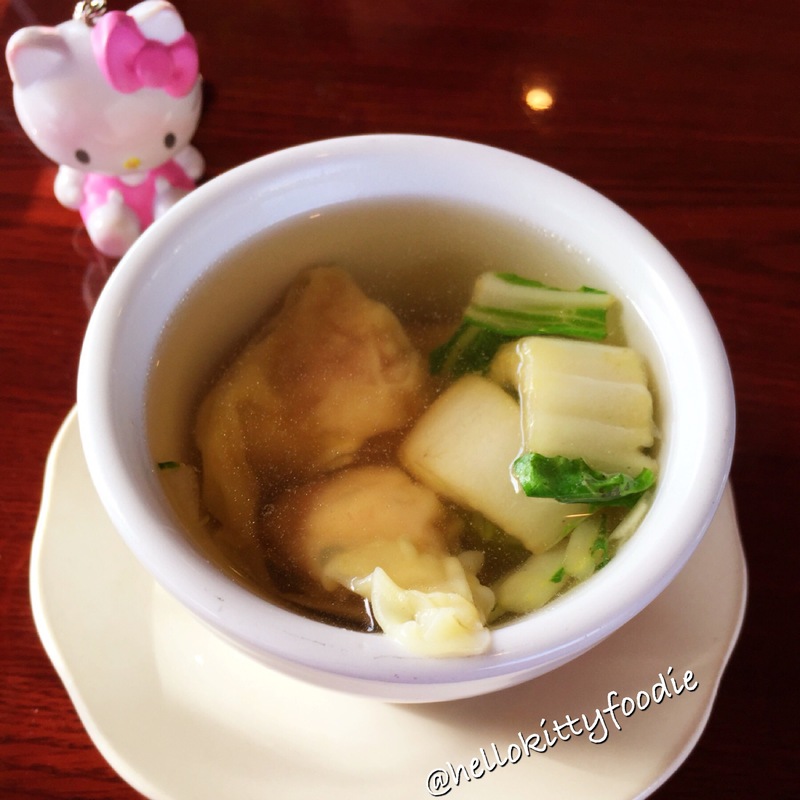 The soup that they offer is a wonderfully light and comforting soup filled with wontons and bok choy. The wontons are filled with ground chicken. There are two particular dishes that I always love getting here. My first favorite dish is their Stuffed Chicken Wing. It is a boneless chicken wing that is stuffed with pork, chicken, onions and glass noodles. It comes with two dipping sauces, a sweet and sour sauce and a cucumber sauce. The cucumber sauce is a like a little mini salad because it has mixture of onions and peanuts. I simply love the fried chicken wing because it is perfectly crispy. The stuffing inside is so fulfilling. 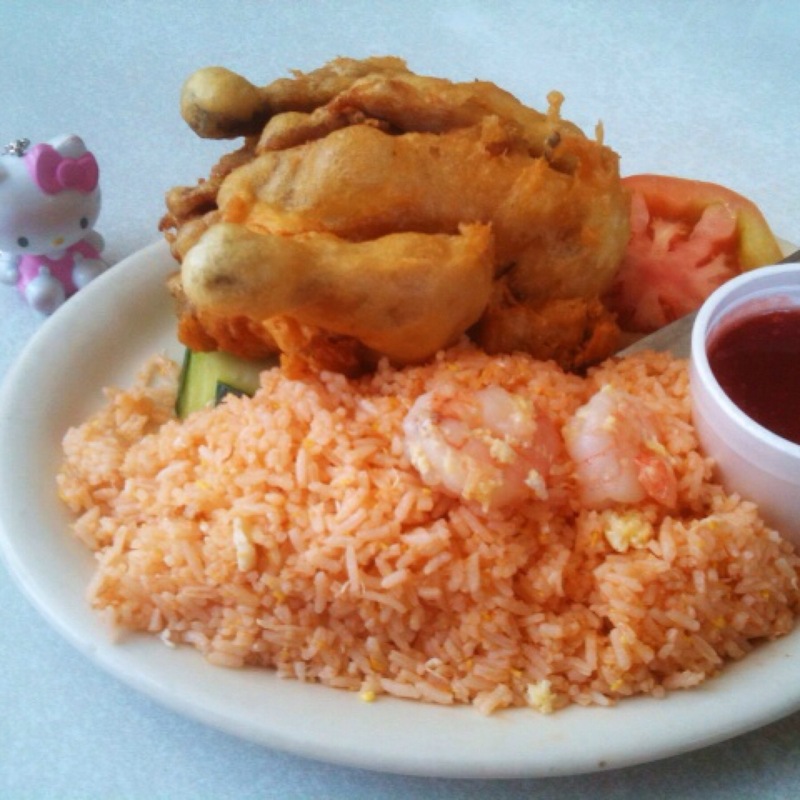 The chicken is perfectly paired with fried rice. My other favorite dish at Thai Thani is their Pad Thai. I’ve tried many Thai restaurants but Thai Thani for me has the best Pad Thai. The flavor of the Pad Thai here cannot be beat. The noodle dish has soft noodles and is topped with a great mixture of shrimp, baked tofu, bean sprouts and crushed peanuts. Wonderful flavor and texture, these noodles are always a must for me when I come here. I love this place as you can see via this blog post and via my previous Yelp reviews and hope to have many more smiley lunches and dinners here in the future. In all my various blogging adventures, the most special ones to me are the ones I get to share with my family and friends. Today was one of those special times as I got to celebrate a very special occasion, my mom’s birthday. We actually had different plans for the day but we accidentally found ourselves at a place I’ve had on my bookmarks for awhile, Thai Original BBQ. It’s a sister restaurant of one our favorite restaurants in Redondo Beach, Thai Thani. My mom and I are both fans of Thai food and we were excited to try this place out. Since it was my mom’s birthday, we had to order noodles. It’s an Asian tradition to order noodles during ones birthday because long noodles are symbolic of long life. The other dish we tried was the Chicken ruby dinner. It’s dish with deep fried whole baby hen stuffed with a combination if shrimp and pork. On the side is shrimp fried rice and a homemade sauce for dipping. The stuffed baby hen is amazing. It’s deep fried to a perfectly golden color and crisp. The inside is a finely ground pork filling that is comparable to a meatball. Fresh and crispy, this was a great chicken dish. It was a really nice birthday dining experience for my mom and I really enjoyed sharing another foodie blog adventure with her. It’s always a good, smiley day when I see my mom smile. 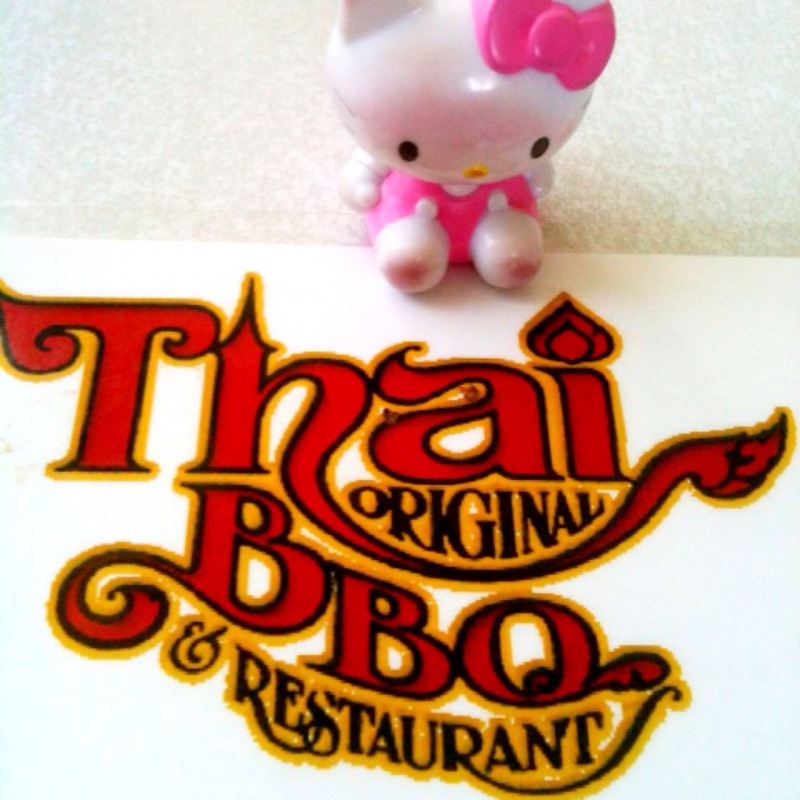 For more smiles, please see my recent Yelp review on Thai Original BBQ.